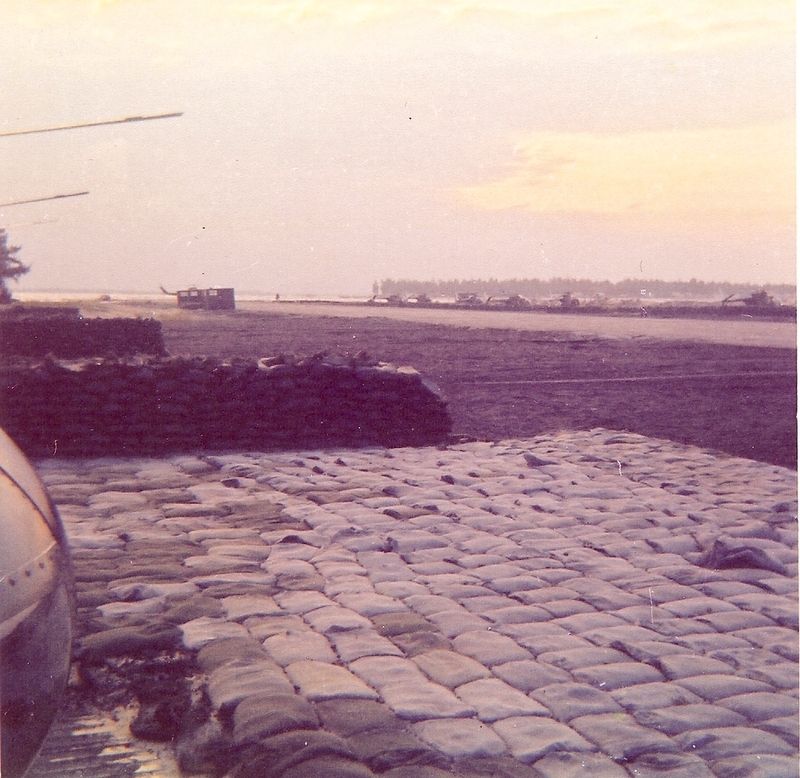 I'm sitting at one of the Marine advisors outposts here, having coffee before flying a mission for them. I was assigned as a gun pilot but we lost a pretty good chunk of the slick drivers in the Easter invasion to AA and SA-7 so I flew slicks during my tour. 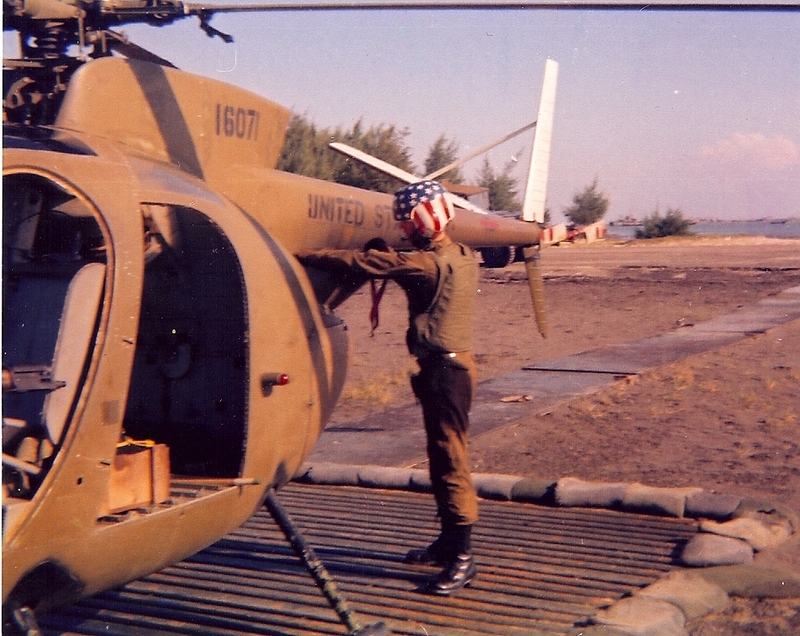 I stayed in the Army for 30 years retired as a COL. 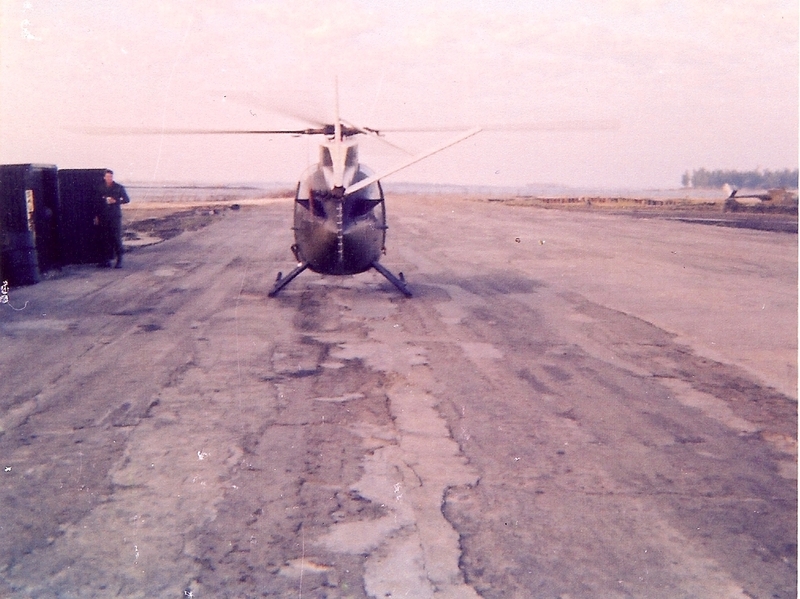 Here is a shot of me standing in front of one of the slicks, tail number 358, which had a well deserved reputation for a weak engine - Hence 35 pig. 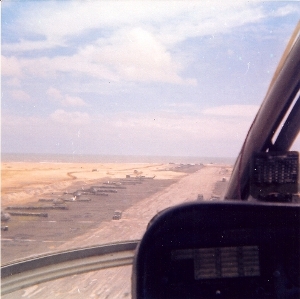 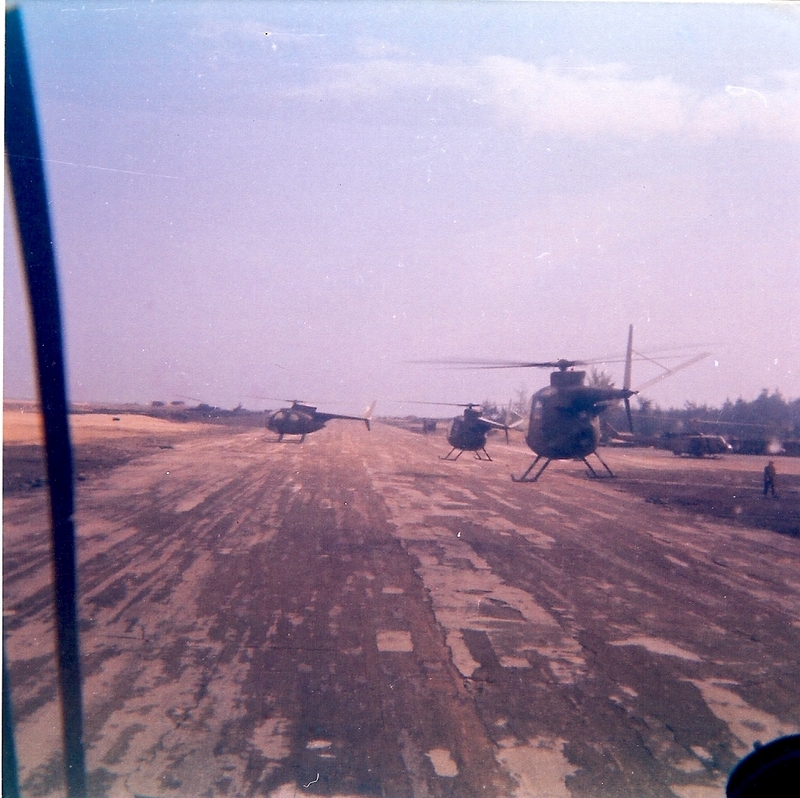 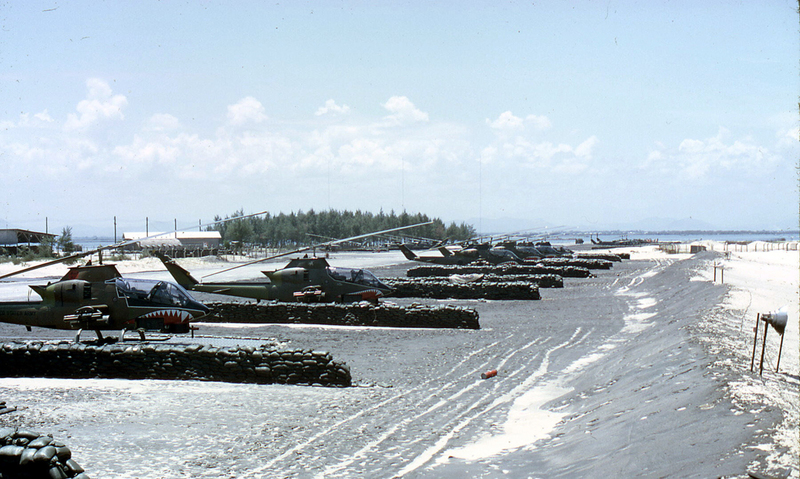 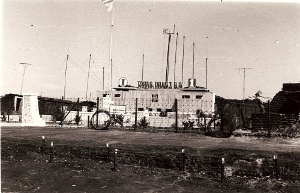 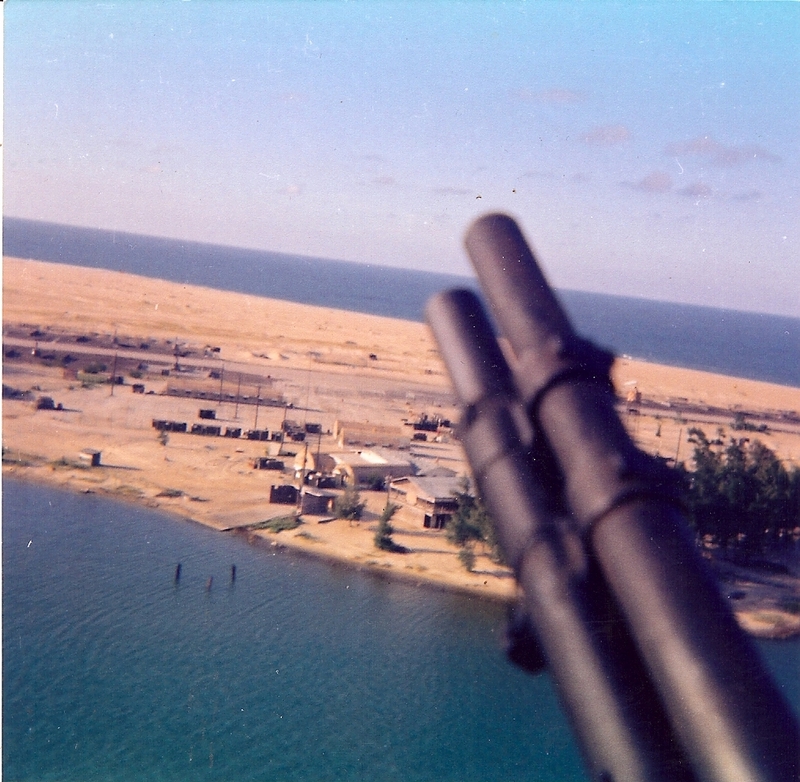 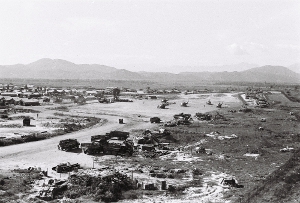 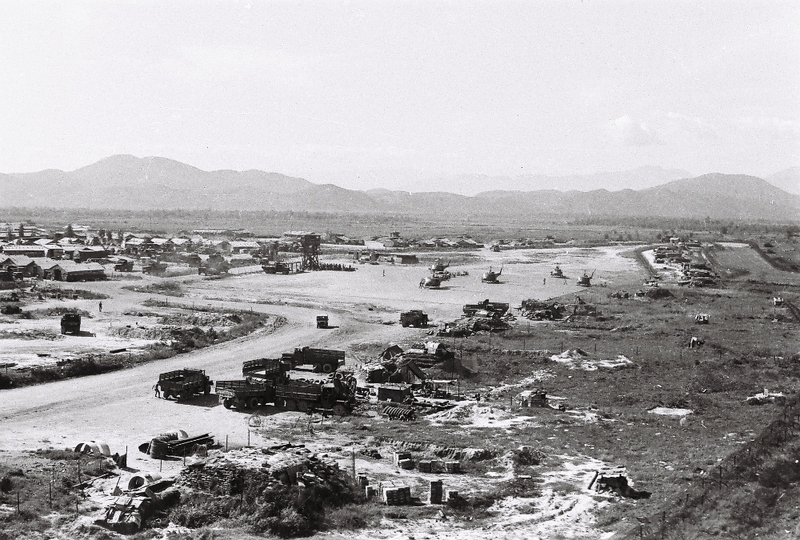 F/4 Cav flight line at Tan My island, taken in 1972. 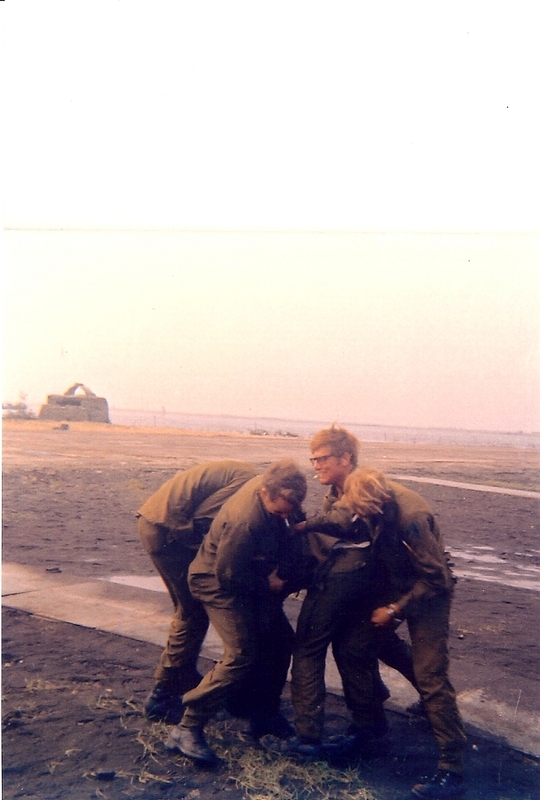 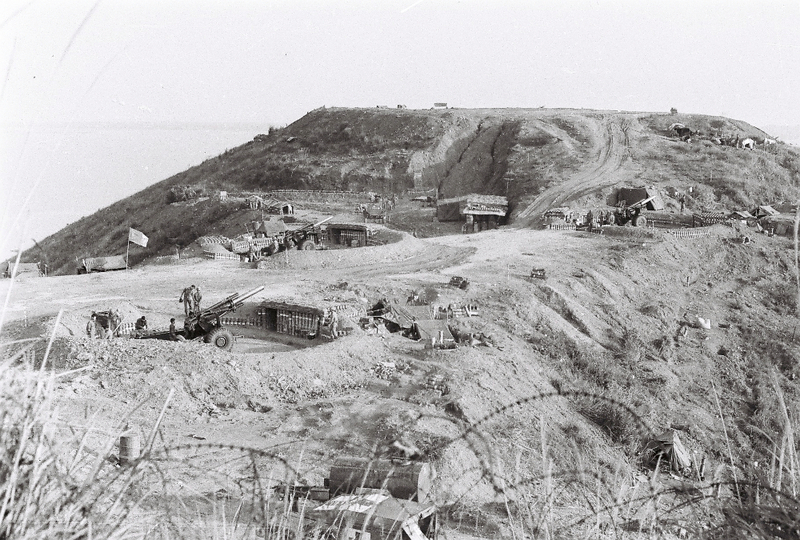 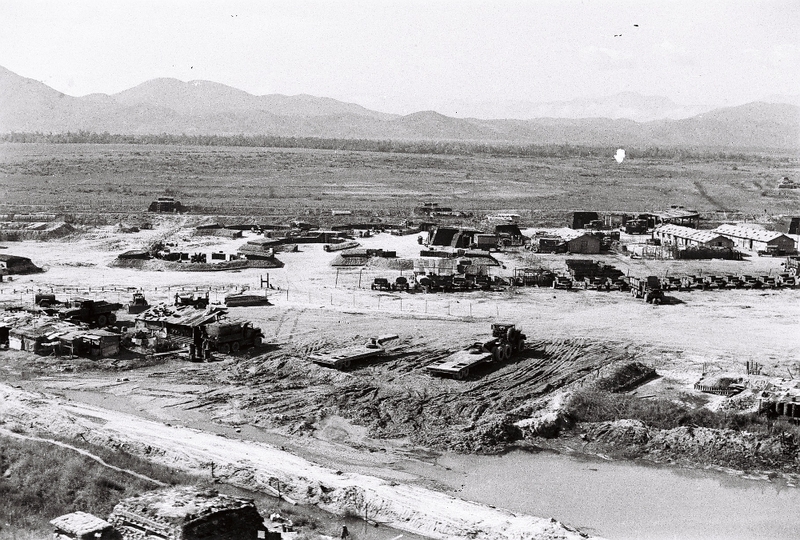 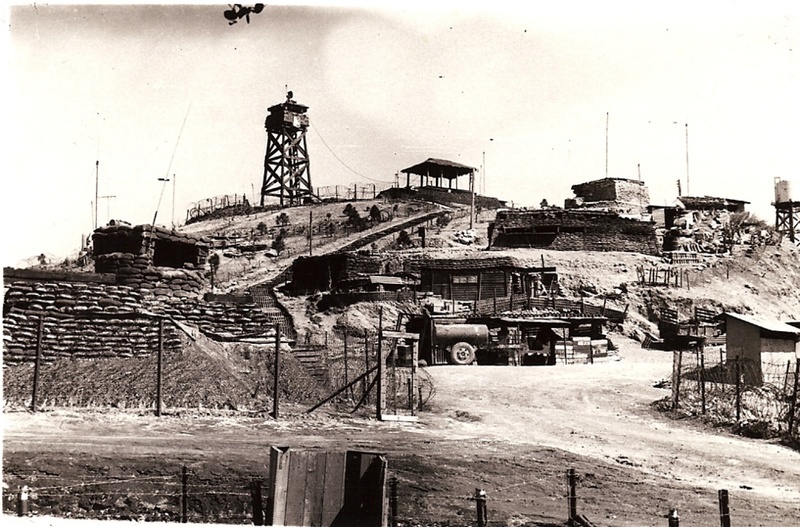 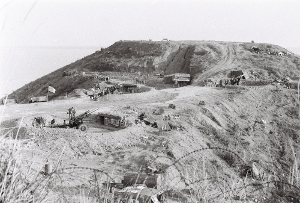 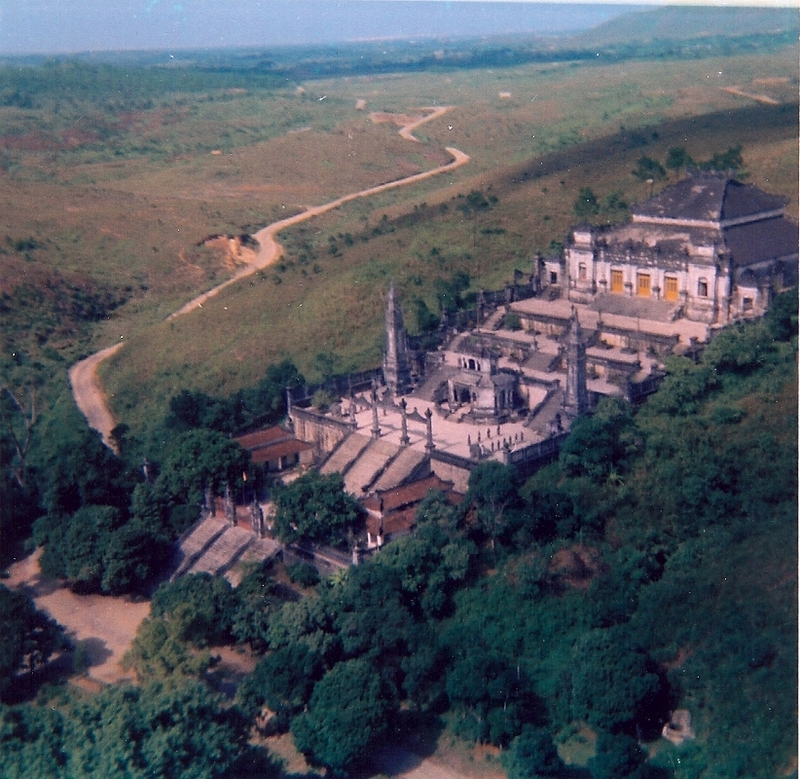 Unit was TAC E�d up north for the Easter 72 invasion and initially bunked out of Phu Bai, but moved in July of 72 to an abandoned Navy installation just east of Hue to avoid the nightly 122mm rocket attacks. 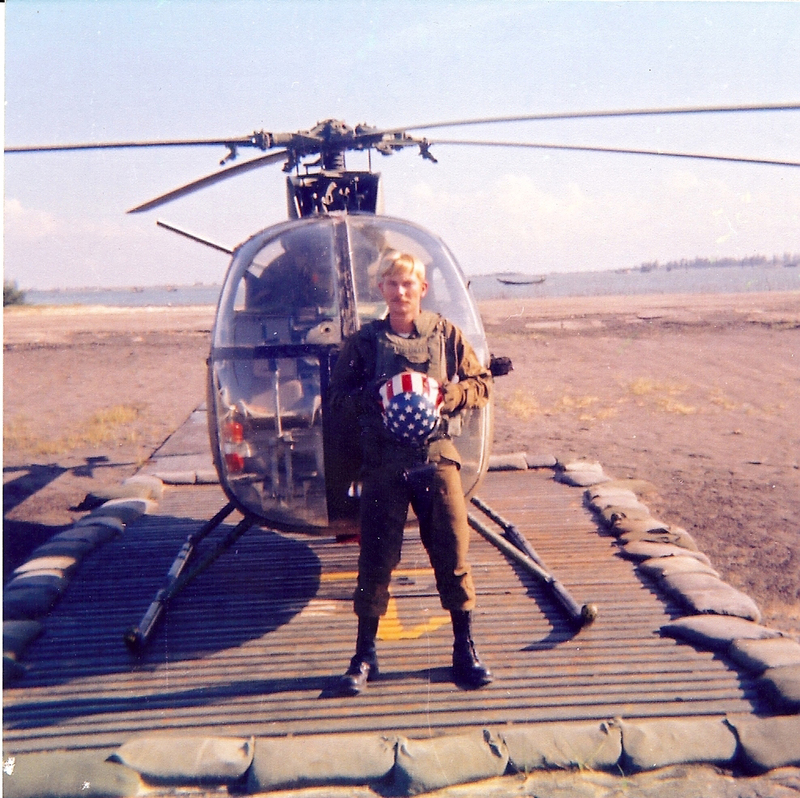 I was a 1LT pilot at the time. 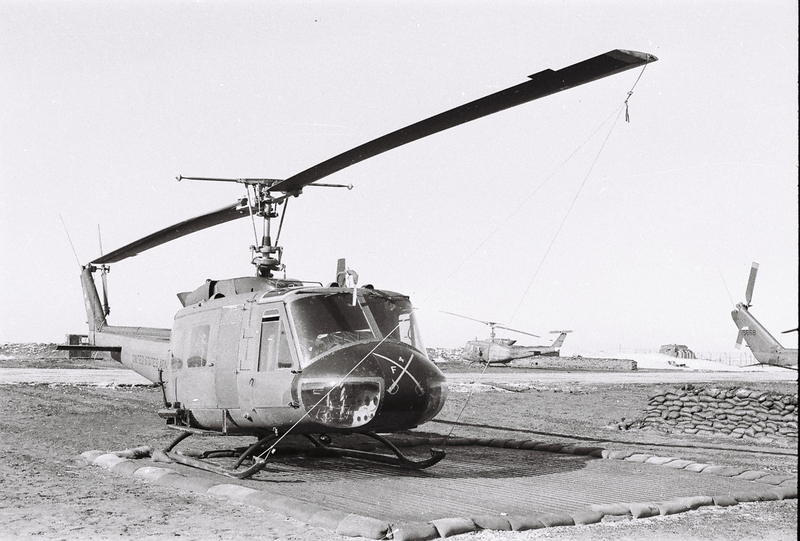 H-model Huey tail #16286 with it's main and tail rotor blades tied down between missions, The call sign for this aircraft was Centaur 286. 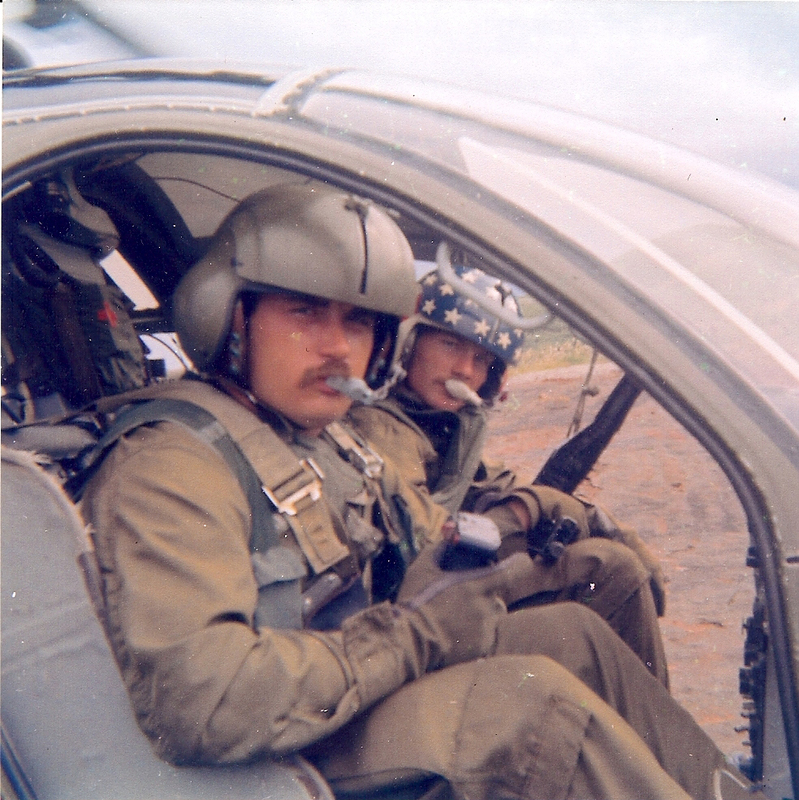 Bob Totten was the crew chief and Brian Harrison the door gunner end of 1972. 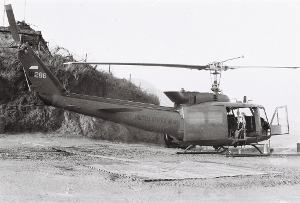 A number of pilots flew 286 - LT Keirsey, LT Holms, etc. 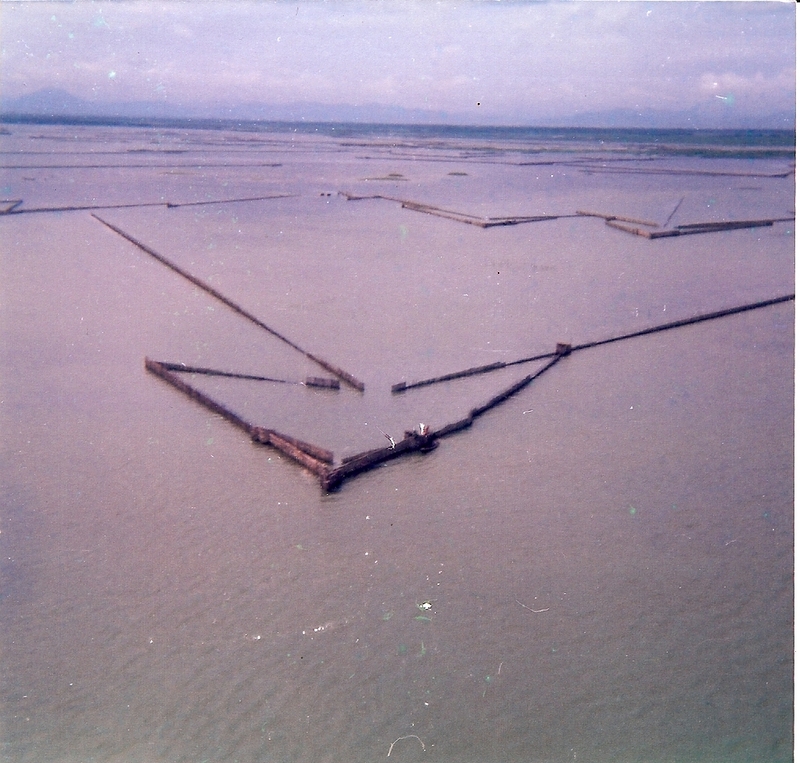 Tan My "Island" is actually a peninsula on the coast of the South China Sea. This is my only picture of Bob Totten, crew chief of 16286 in 1972 and 1973. 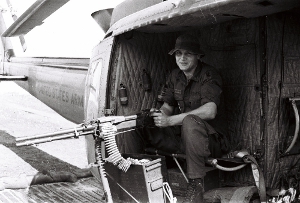 Bob is sitting on the "door gunner" side of the Huey... as crew chief he normally would sit on the other (left) side of the aircraft. 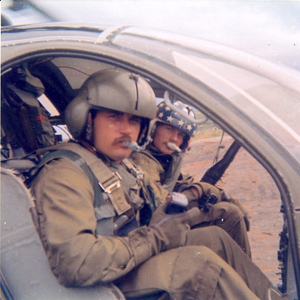 The crew chief was responsible for all aspects of the aircraft, including maintenance and weapons systems. When taking off, the crew chief would report "clear up left", and the door gunner "clear up right", prior to the pilots hovering the aircraft. 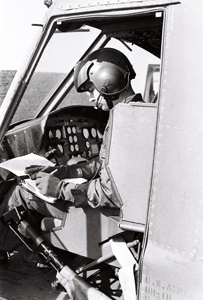 The aircraft commander (lead pilot) sat on the left side, and more often than not the aircraft commander would fly or turn the aircraft so the interesting views were off the left side. 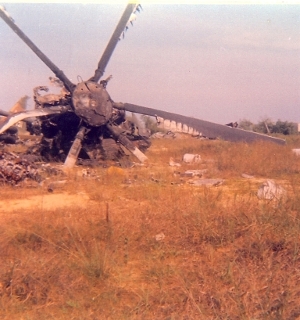 Note the upturned exhaust, the purpose of which was to try and diffuse the turbine exhaust to make the aircraft less vulnerable to Russian SA-7 (Strela-2) shoulder-fired heat-seeking missiles, which were introduced in Vietnam in the early 1970s. 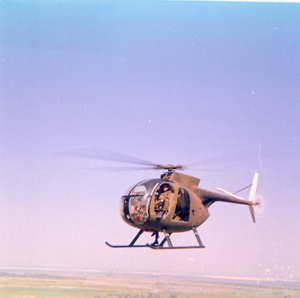 "Neal" a huey crew chief is sitting in the huey in the foreground. Cobras and Loaches were typically parked on the other side of the flight line. 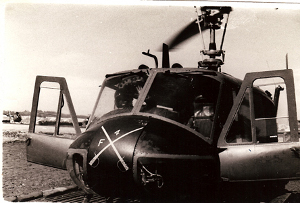 Two photographs of 16286 with the "peter pilot" (pilot 2nd in command) Lt Holms still in the aircraft. In the first photograph a loach can be seen parked on the other side of the flight line. I was transferred into F/4 as a rifleman (security and aero-rifles) in late October or early November 1972. 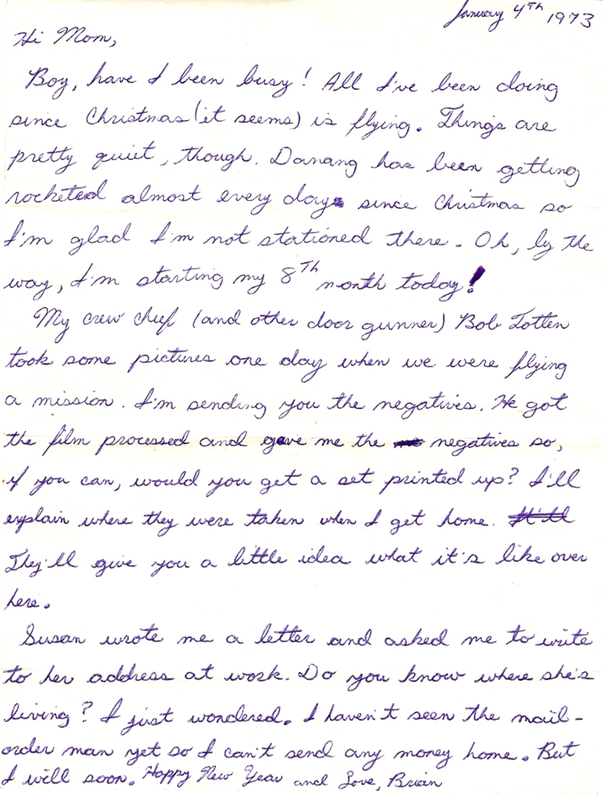 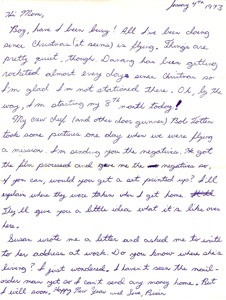 Here is the letter mailed to my parents describing Tan My Island. 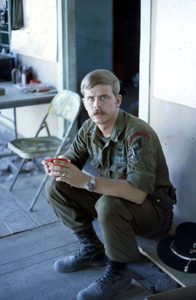 Major Kermit Larson replaced Major John Spencer who commanded F Troop (and it's predecessor D 3/4 Cav) for 3 years (tours) and left in September 1972 only because of family issues at home. 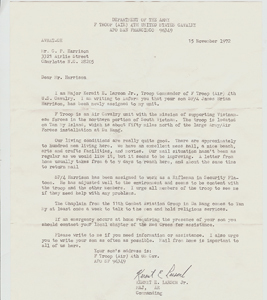 F Troop originally was part of the 25th Division, but remained in Vietnam when the division stood down in 1971. 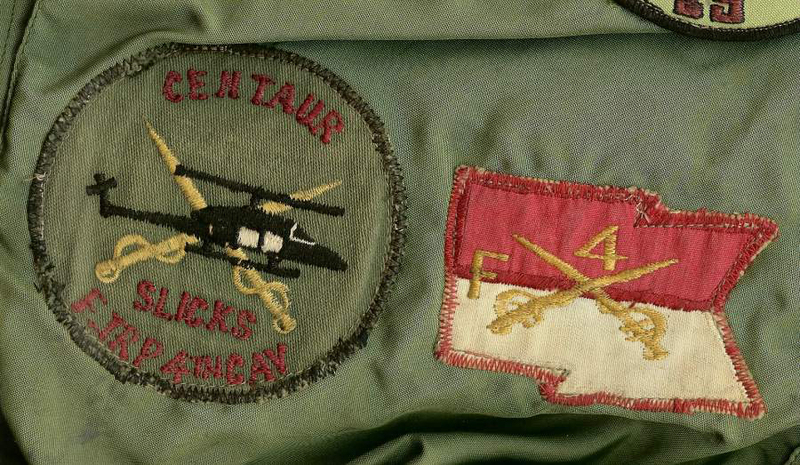 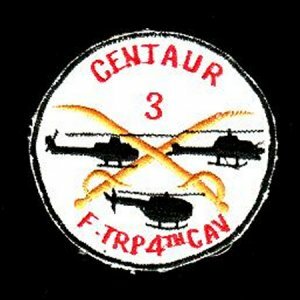 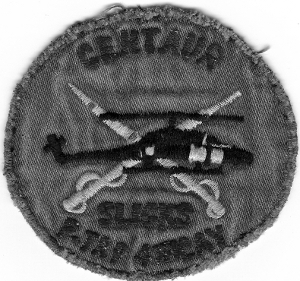 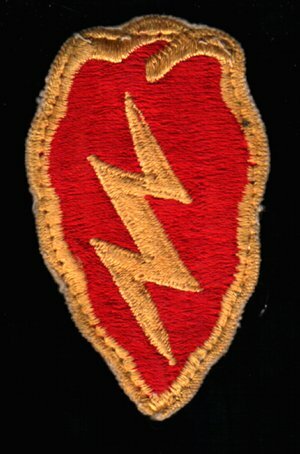 Afterwards, F/4 flew as part of the 1st Aviation Brigade, 11th CAG (Combat Aviation Group). 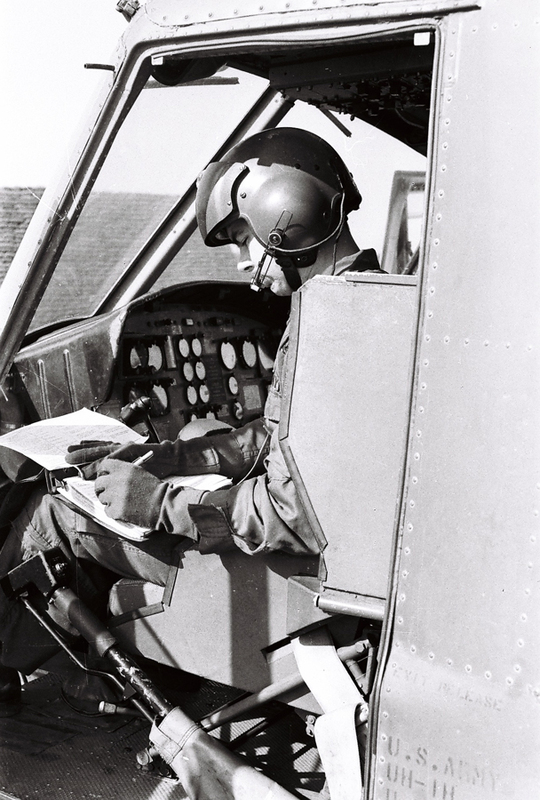 Here is a picture of Lt Keirsey as A/C (aircraft commander) in "286" late 1972. 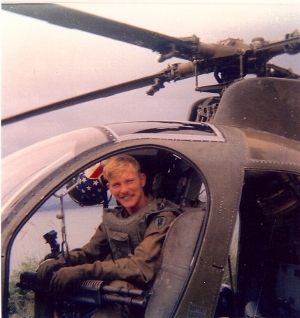 I was a pretty big guy - 6' 5" and 190 lbs, really too big to be a door gunner (because of weight constraints) but they let me fly. Note the smoke grenades hanging on the wall to my right (red yellow, green, and purple - violet), smoke was used out to mark ground targets. 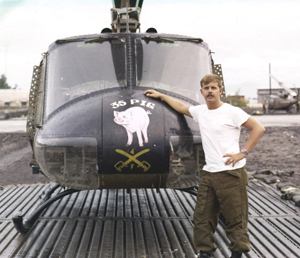 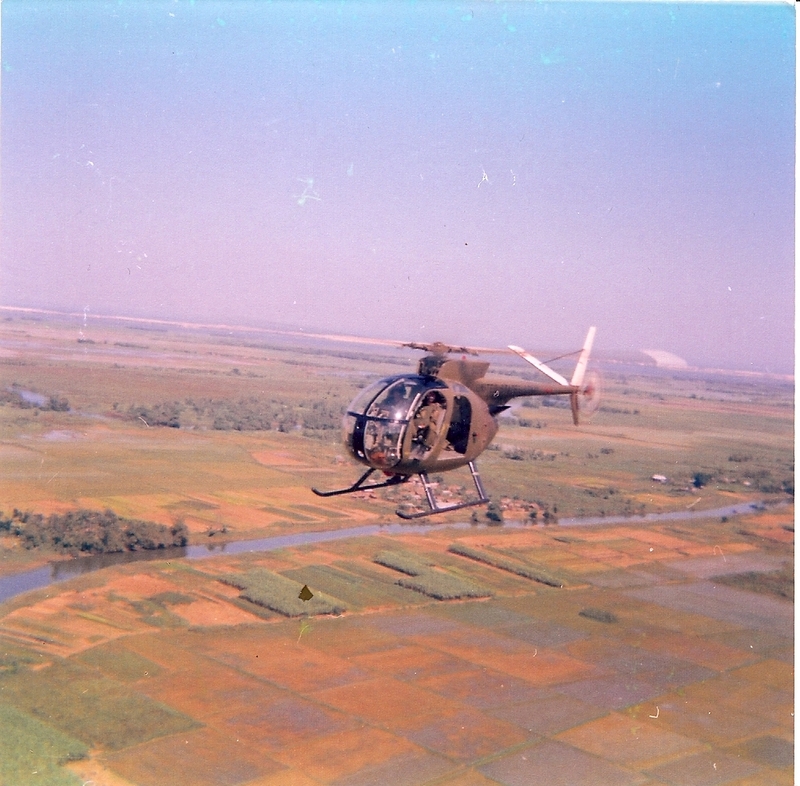 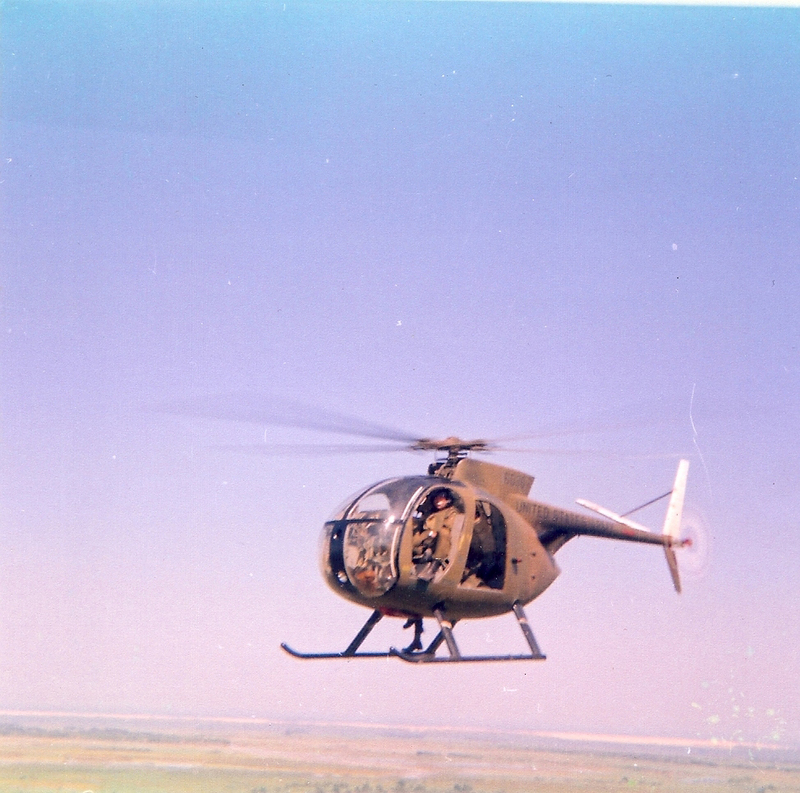 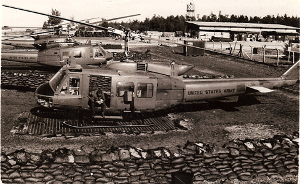 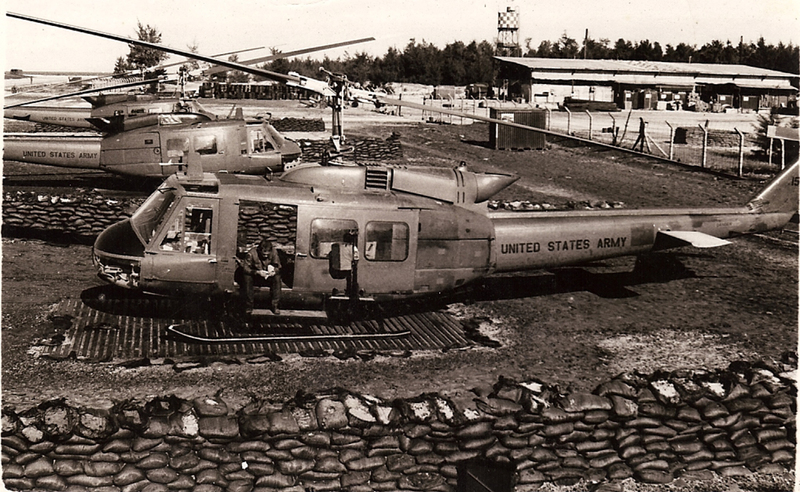 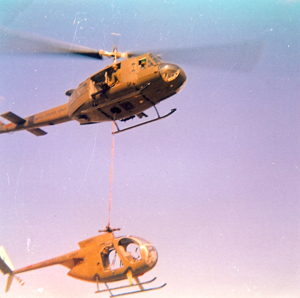 Some of the hueys had twin 60s (or even a 50 and 7.62 mini-gun) but "286" had a single M-60 on each side. This "Air 60" has a thumb trigger, a shortened barrel (flash suppressor and bipod cut off) and a fold-down round air sight (which no one used). 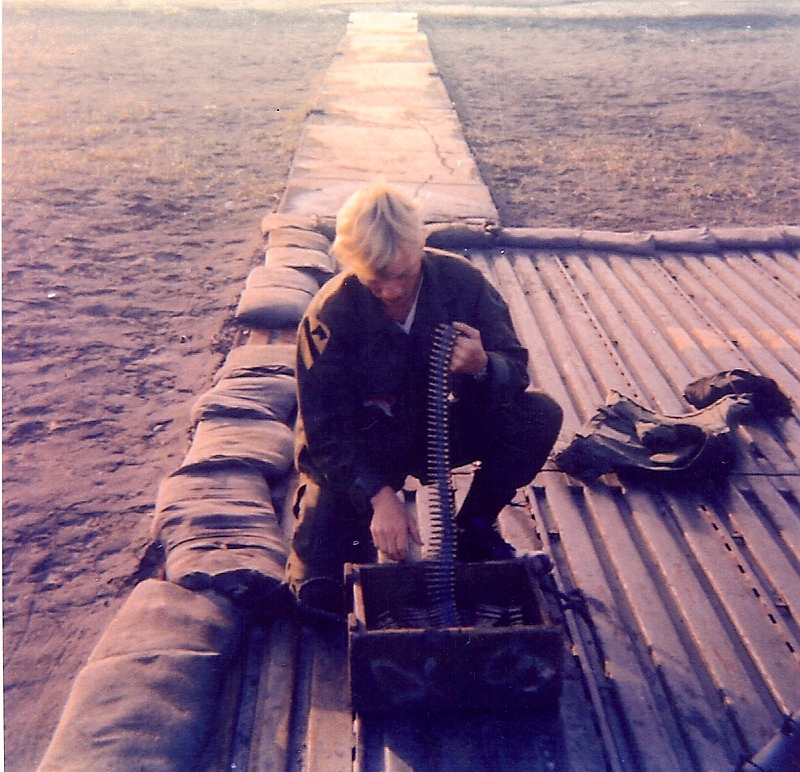 At the point where the ammo belt feeds into the M-60 there is a grapefruit can mounted to help elevate the ammo belt at the feed point to keep it feeding correctly. The ammo box holds 2000 rounds of 7.62 ammo (a tracer every fifth round), and minigun ammo was preferred because it was thought that the metal links that held the belt together were stronger. 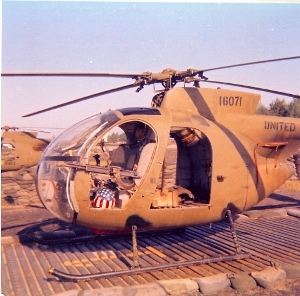 Also seen in the picture is "chicken plate" chest armor, and a "monkey strap" to keep the huey door gunner from falling out of the aircraft. 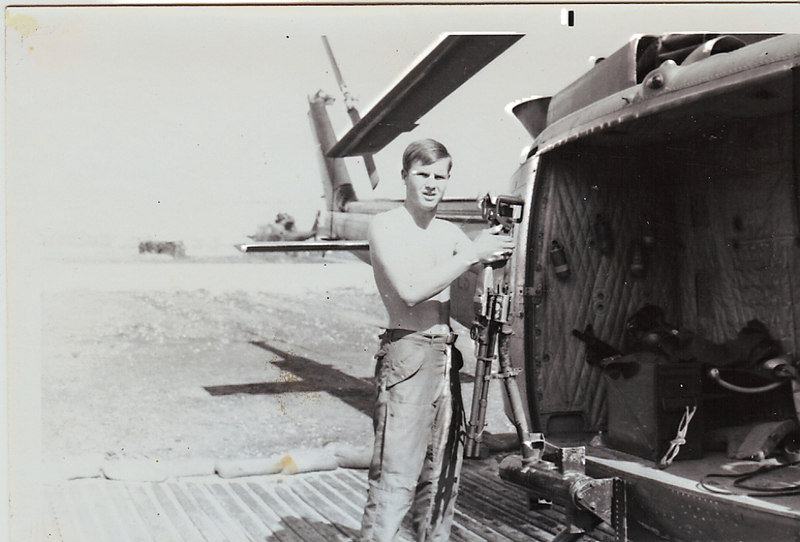 We also carried an extra M-60 barrel, and sat on a flak jacket (or something better) for added protection. Huey crew members also carried one or more additional personal weapons: a M-16 or the smaller CAR-15 or M-79 grenade launcher, and most also wore a pistol - either a 45 automatic or a Wesson 38 revolver (shoulder holster) and carried along a survival vest with pencil flares, strobe light, compass, map, etc. 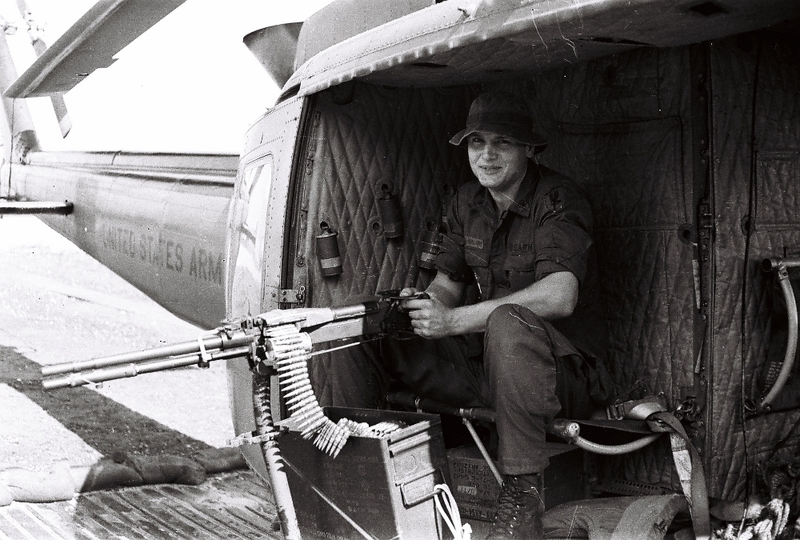 The two primary responsibilities of the door gunner were to "clean the guns" and "polish the bubble". 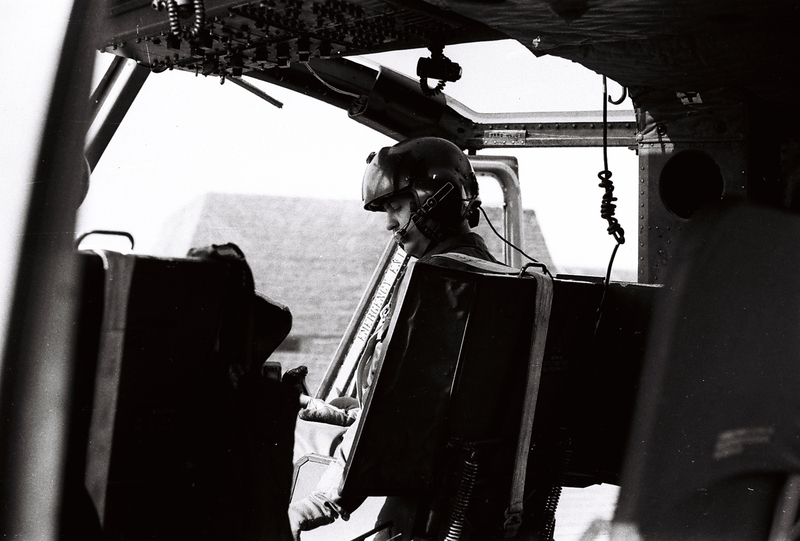 F/4 Huey crew chief Neal in his hooch. F/4 Tan My company area. 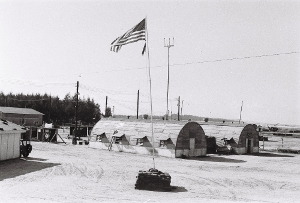 The TOC is the building on the left (jeep), and the Blues were in one of the Quonset huts. 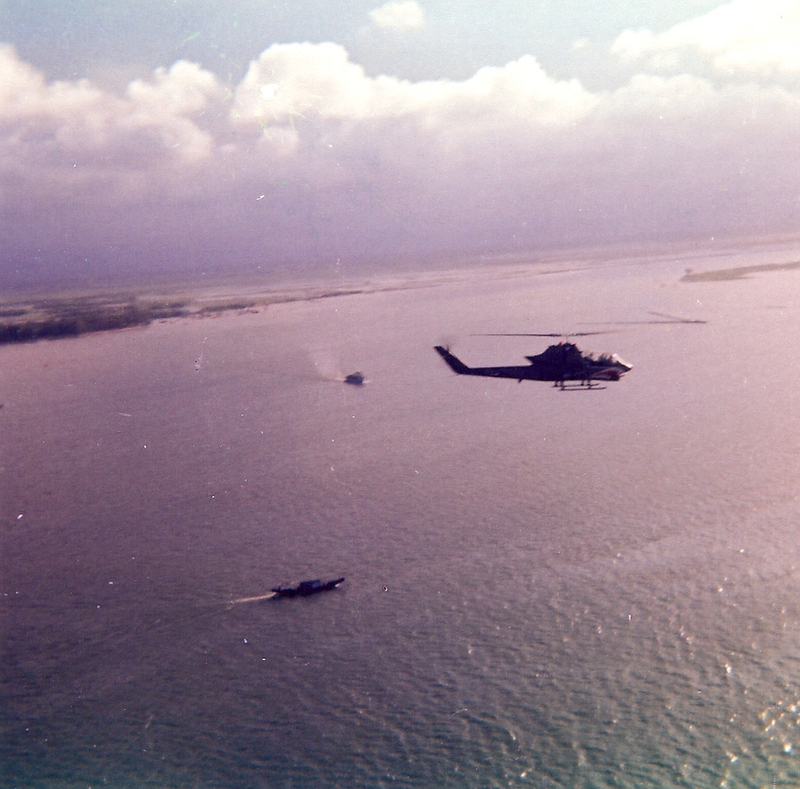 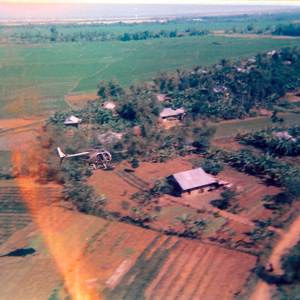 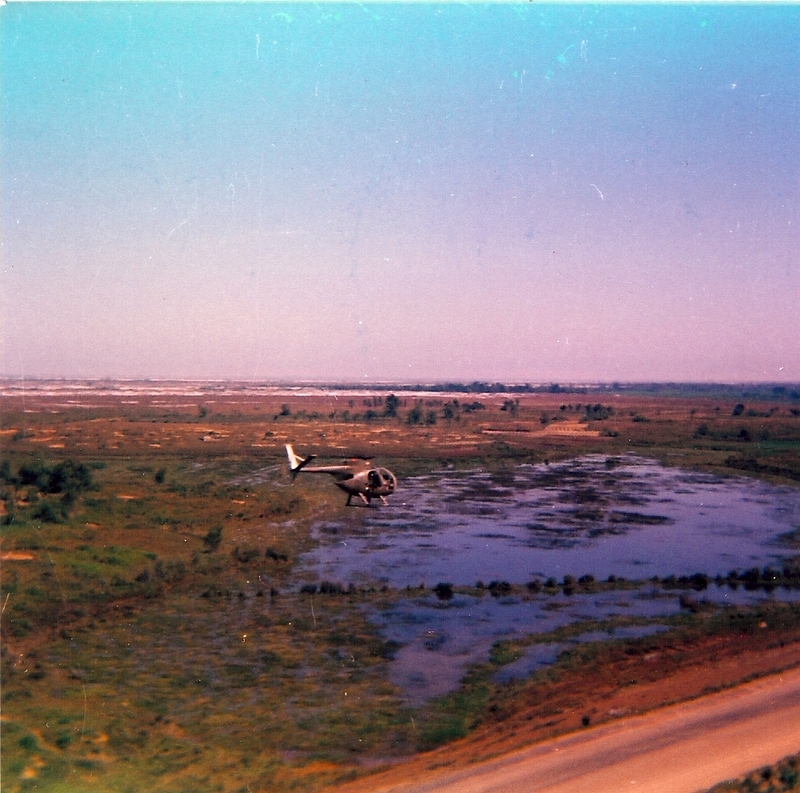 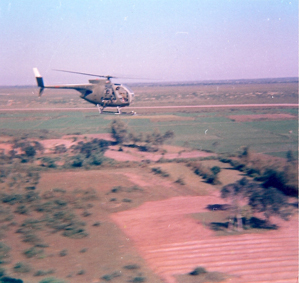 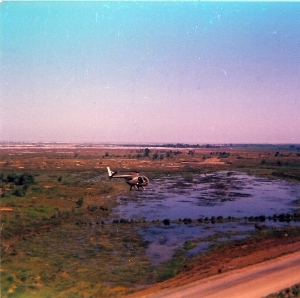 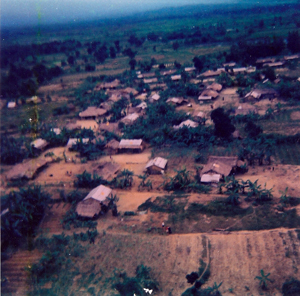 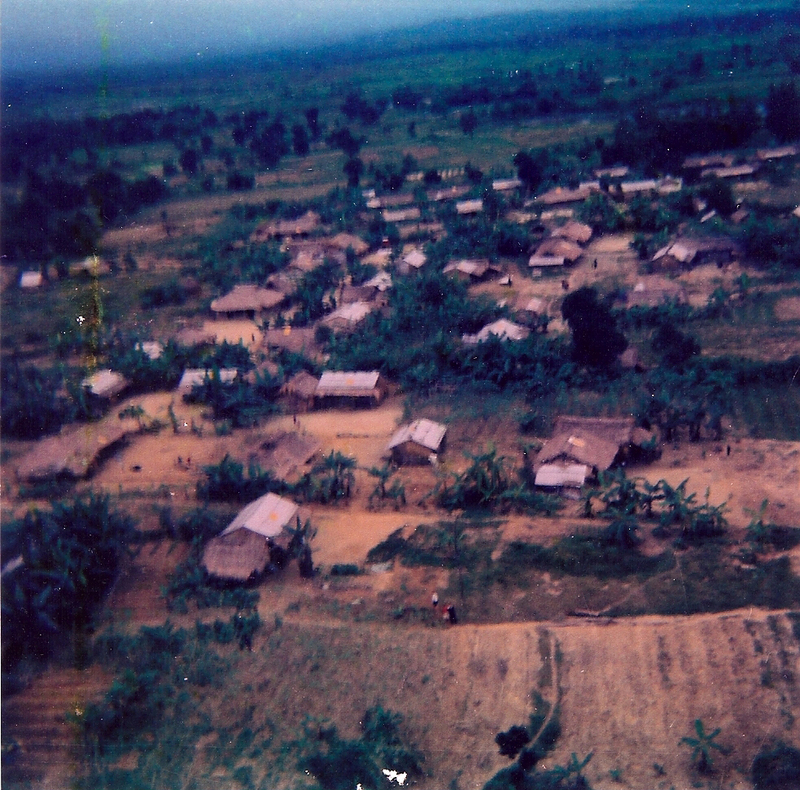 LZ Sally I Corp from the air late 1972. 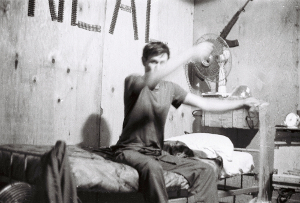 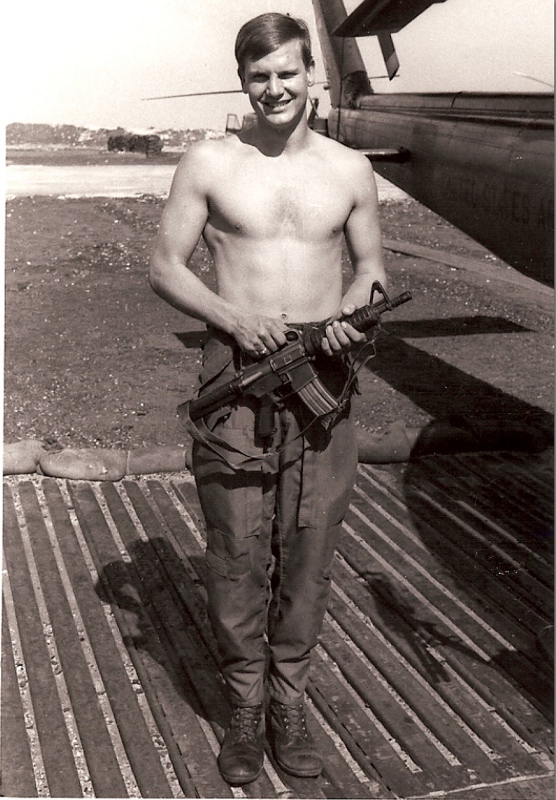 SP/5 Ronald Duncan F/4 Scout platoon sergeant late 1972 at Firebase T-Bone in "Centaur 45". 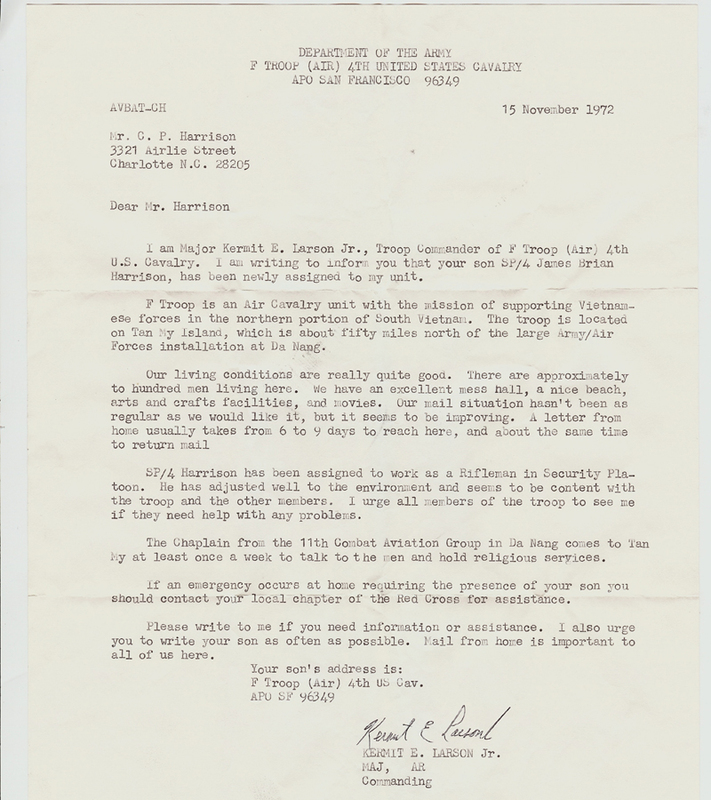 Ronald Duncan was from Mt. 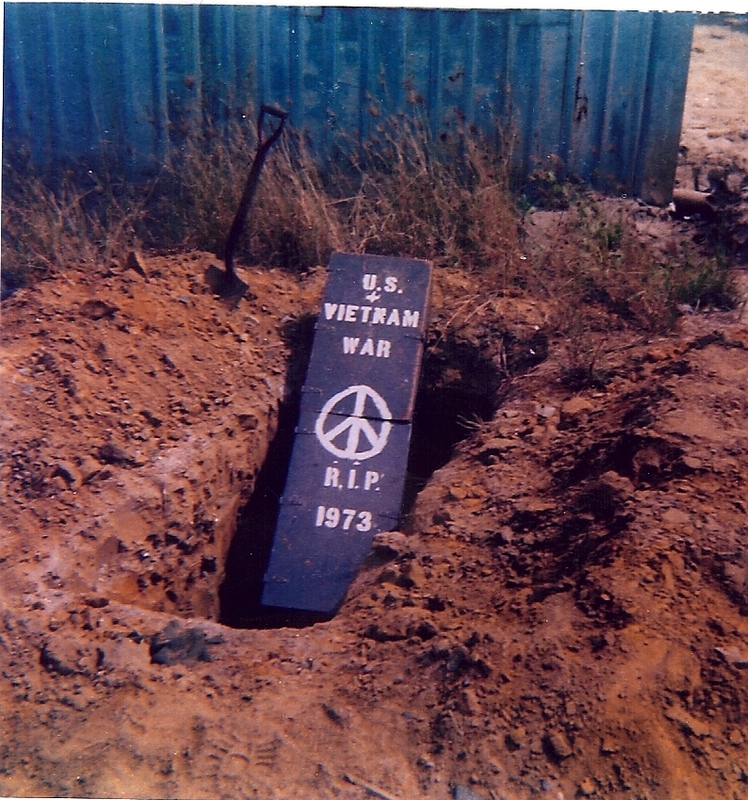 Pleasant, Texas. SP/4 Wayne Moose Scout gunner in "Centaur 45" at Firebase T-Bone late 1972. 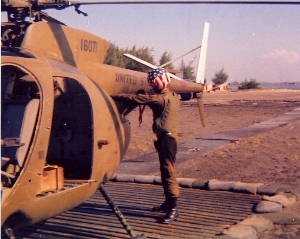 Note the painted helmet. 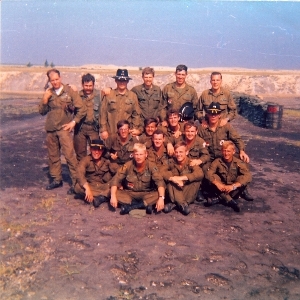 Not shown - Randy Baysinger (scout old timer, and leader) who went home 2-3 weeks before stand down. The CO's (sandbagged) pad looking towards the bay at Tan My. Note the Loach revetments. The loach armory storage conex can be seen towards the left end of the runway. Here is a rear view shot of a loach in front of the loach armory conex. Note the white "skunk tail" stripe painted on the top of the tail boom and tail, this made the loach better seen from above - from the air, the stripe looked like a white arrow. Firebase T-Bone as it looked in late 1972. Note the American advisers working with the ARVN artillery men. 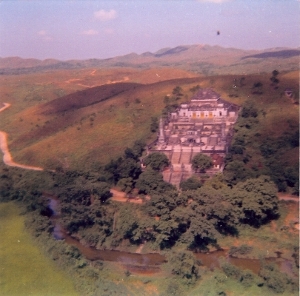 Buddhist temple between Hue and Quang Tri. From the air the doors look like gold (but were probably made of brass). 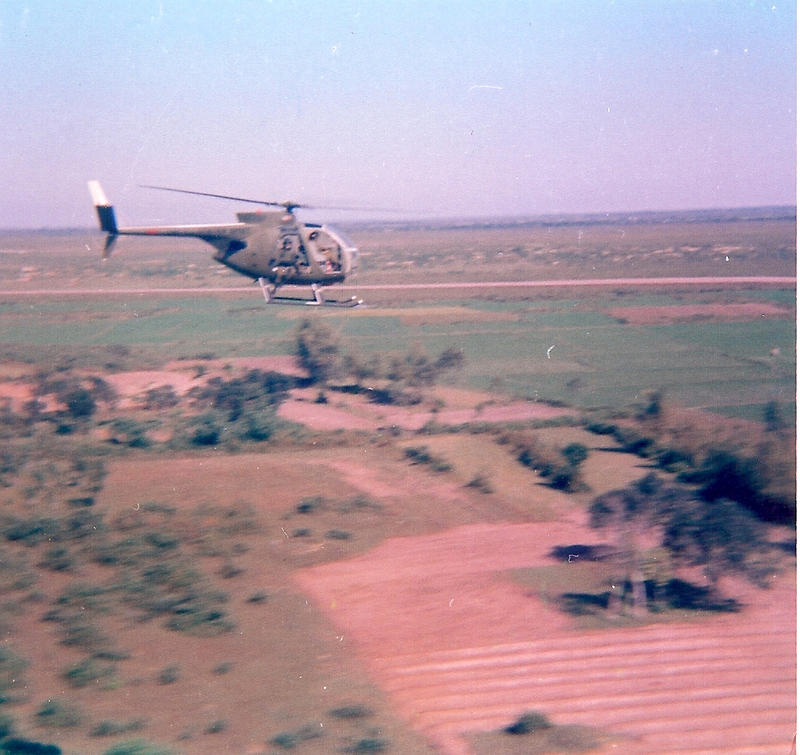 Centaur 286 on final somewhere in I-Corp Dec 1972. 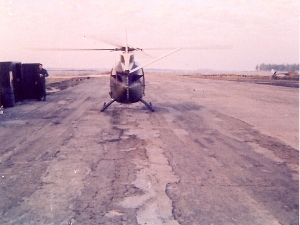 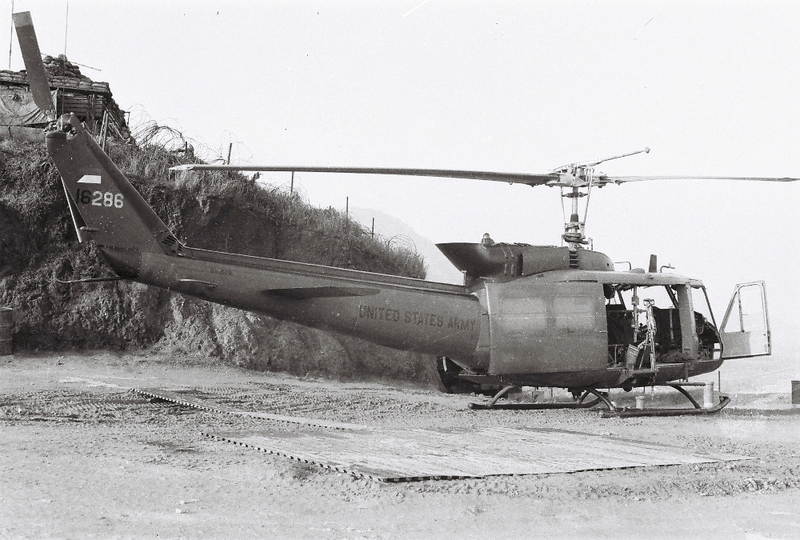 H-model Huey 16286 at Firebase T-Bone end Dec'72. 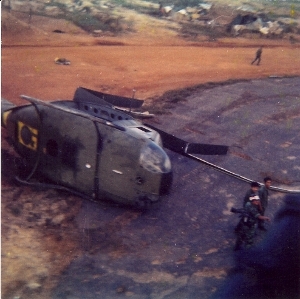 Note the Cav flag on the tail and the upturned exhaust. 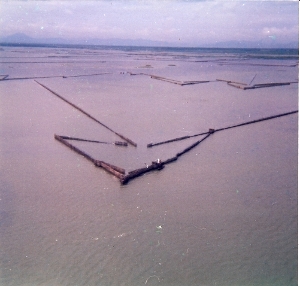 One of the "landmarks" around Tan My was the "fish trap". 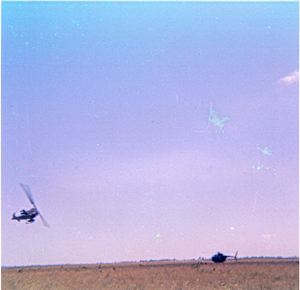 Scouts blow off steam end of the war. 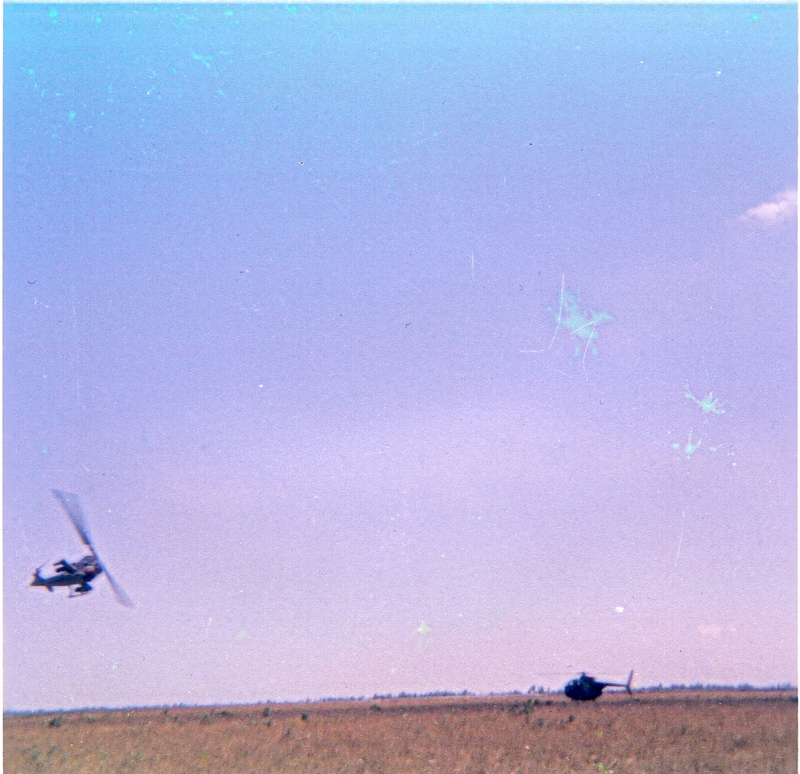 A F/4 pink team was on the ground fueling up at a POL point near QL1 when a South Vietnamese Huey circled once, then crashed near us. 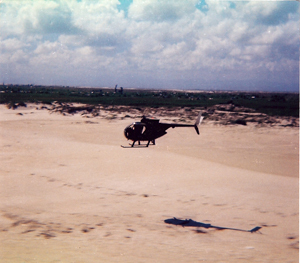 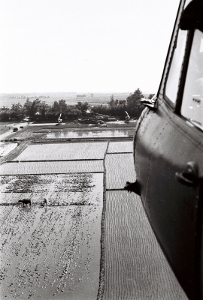 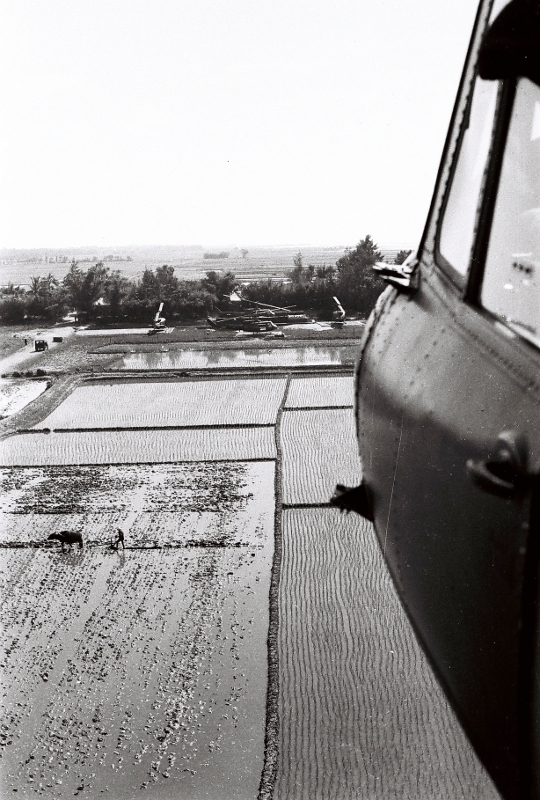 F/4 Scouts flew a number of missions with U.S. Marine officers as FOs (forward observers) directing naval gunfire, usually up near the Cua Viet river. 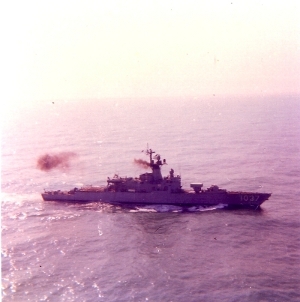 Here is the destroyer that supported us. 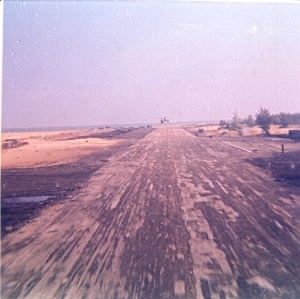 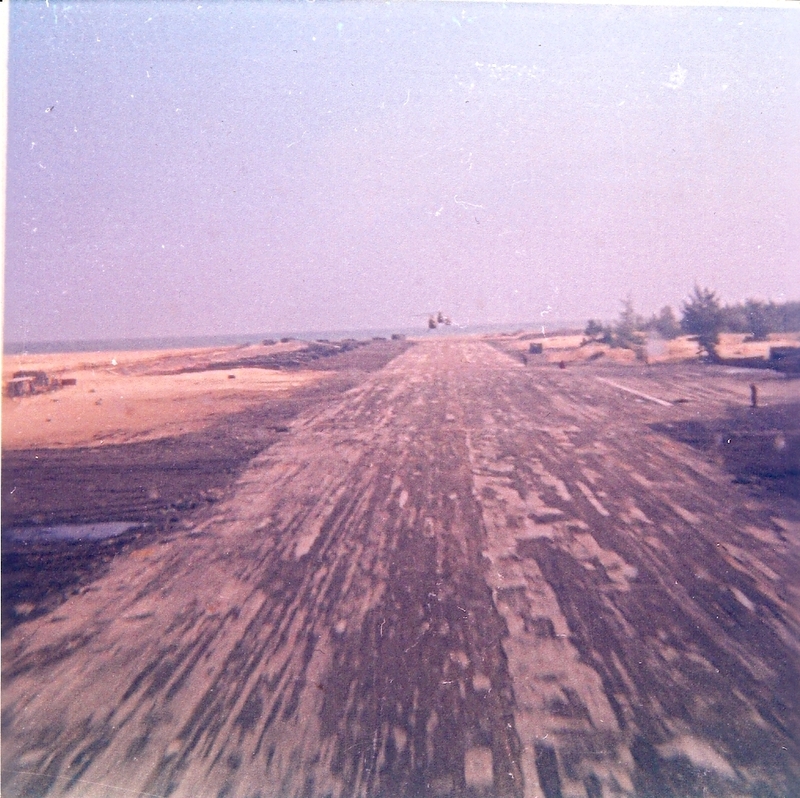 One of F/4 responsibilities was to recon QL-1, a national highway. 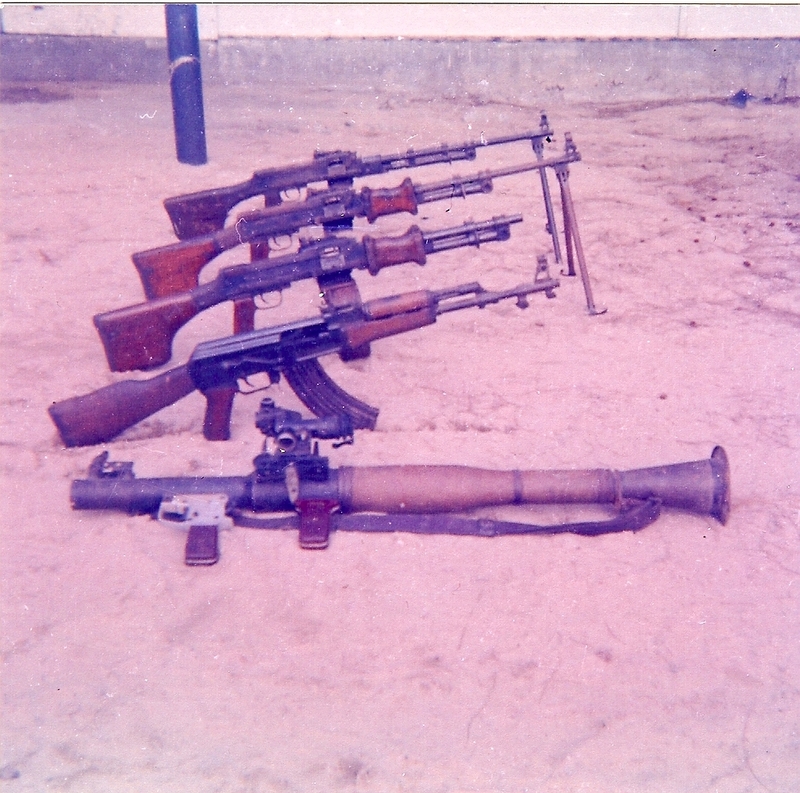 Chicom weapons on display at Tan My. 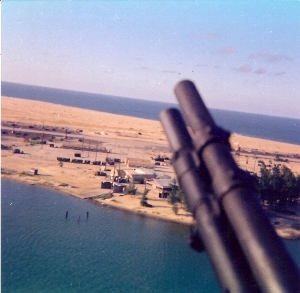 F/4 loach view from high bird. 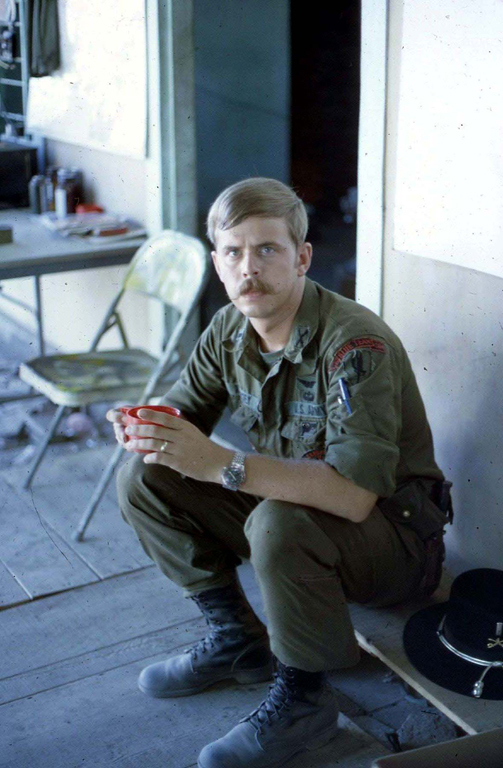 During the 1972 Easter Offensive Scout platoon leader Capt. Frank Walker (Rock Hill SC) saved the life of the pilot of this Jolly Green Giant. 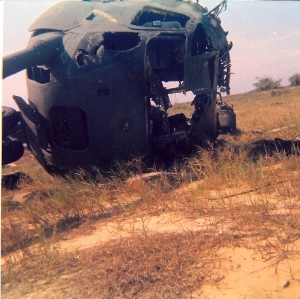 Here is the wreckage as seen later in the war. 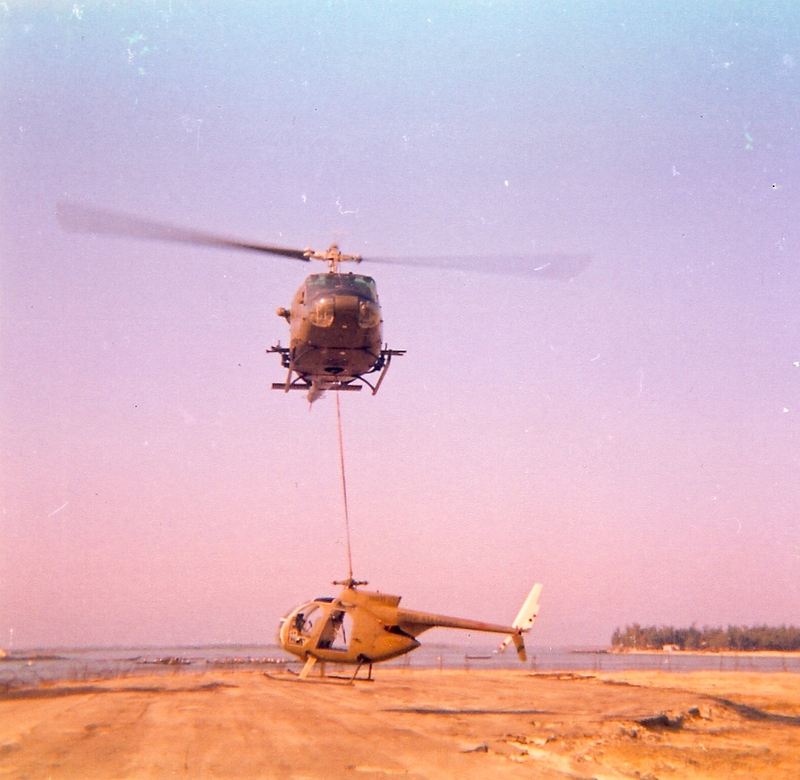 loach 045 being sling-loaded from Tan My to DaNang for repair December 1972. 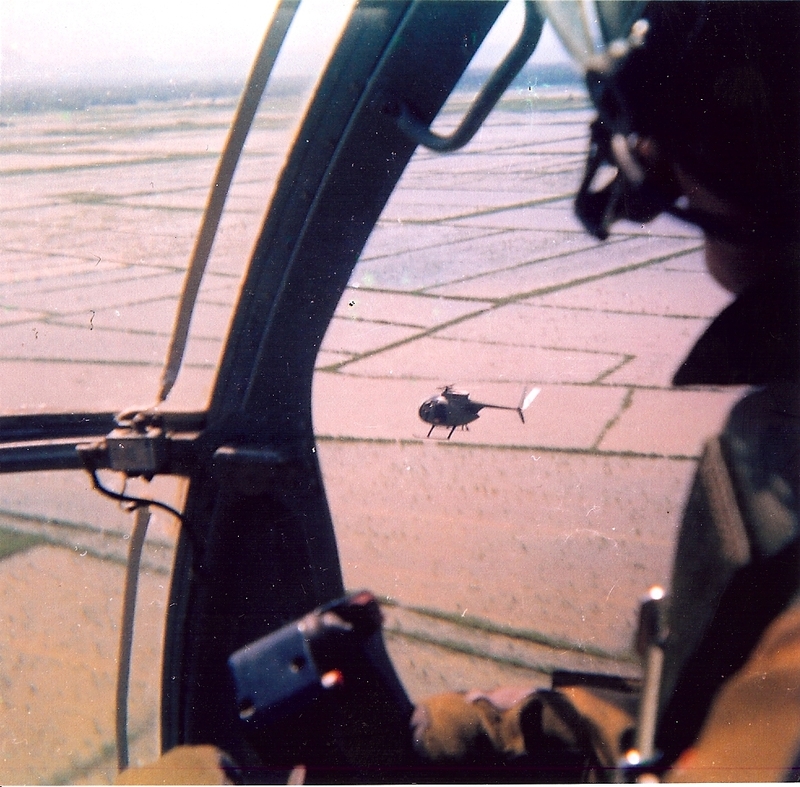 This loach went back to the U.S. and was last used in a drug interdiction role in and around Clayton, Georgia. 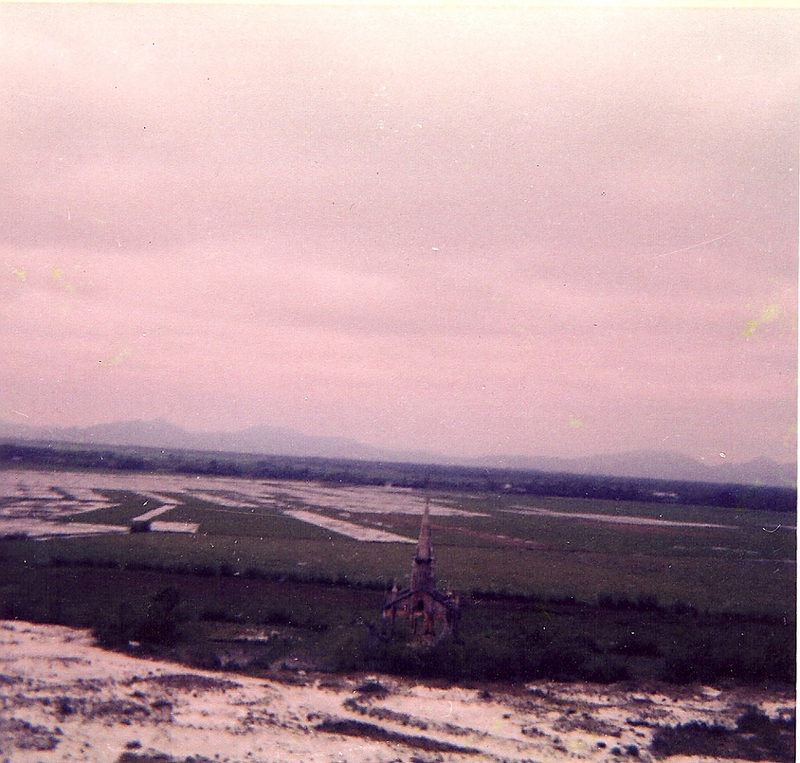 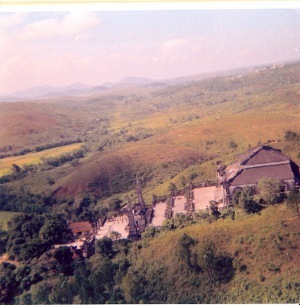 This church in the sandy plain south of Quang Tri was the scene of fighting during the Easter Offensive, spring 1972. 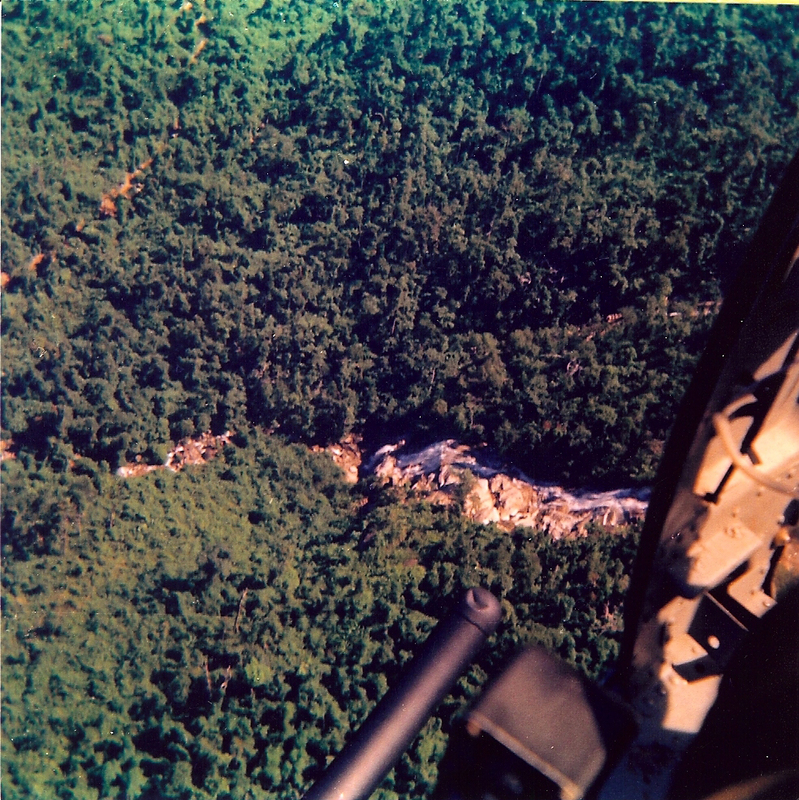 CW0 Clark (pilot) and Sgt Beck (gunner) were both seriously wounded by a command-detonated claymore and the left-seat observer (enlisted man) flew the Loach home. 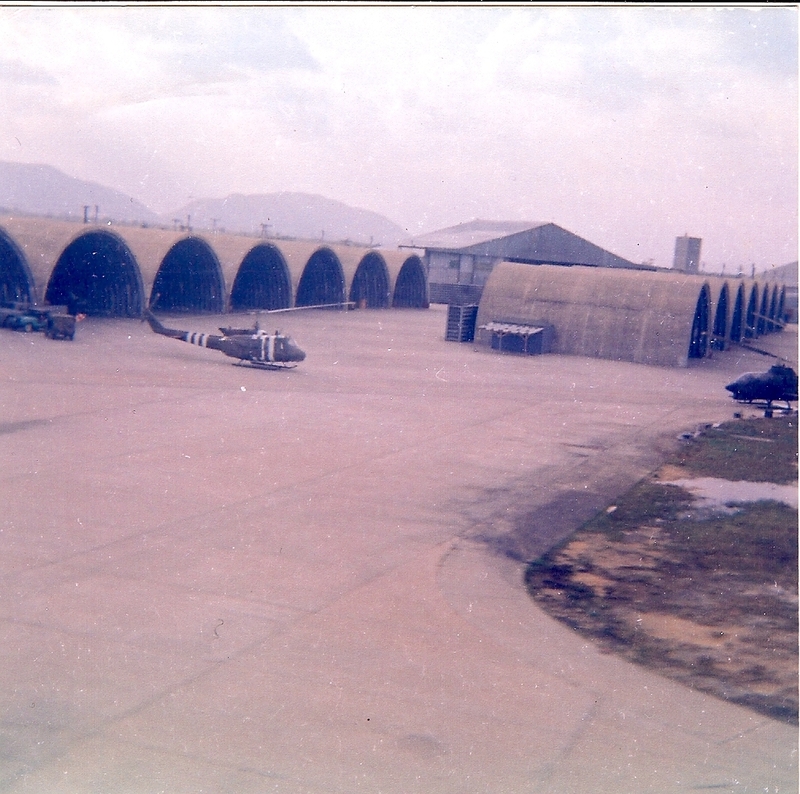 F/4 Cobras were well-known for their painted teeth. 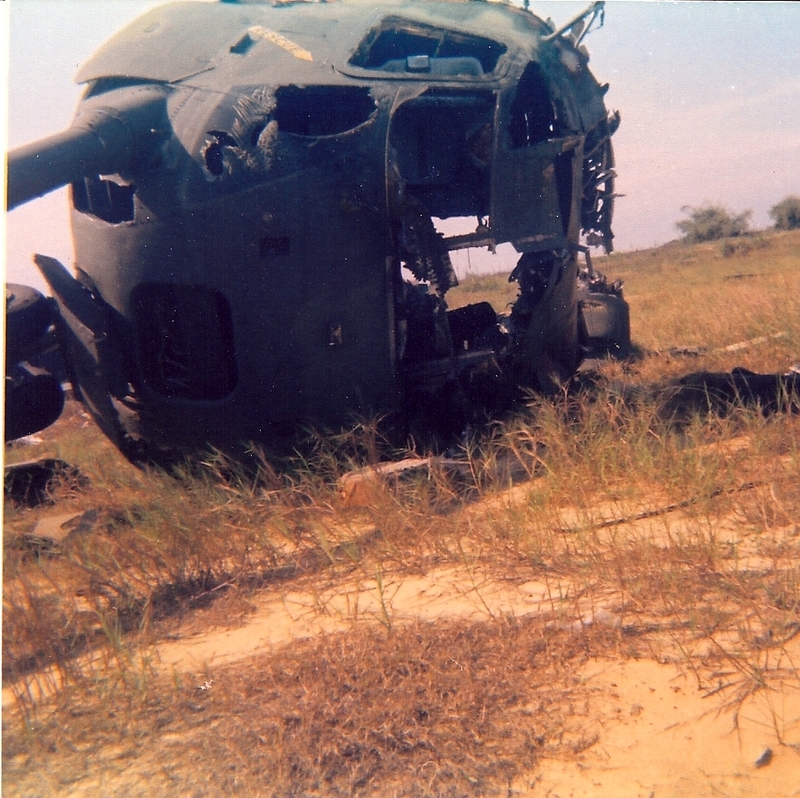 Also note the upturned exhaust, which were retrofitted on all F/4 aircraft in 1972. 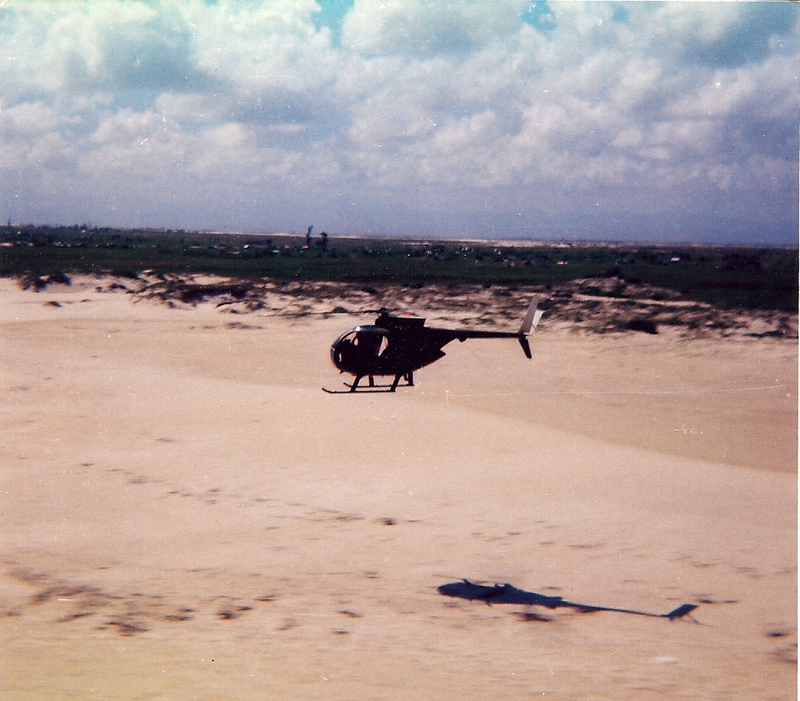 Loaches recon a village off QL-1. 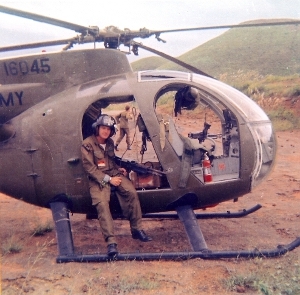 Wayne Moose in front of Loach. 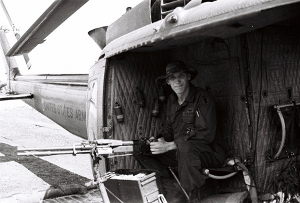 Lt. Mahan (from Boston MA) and Wayne Moose (Charlotte NC) during a scout mission. 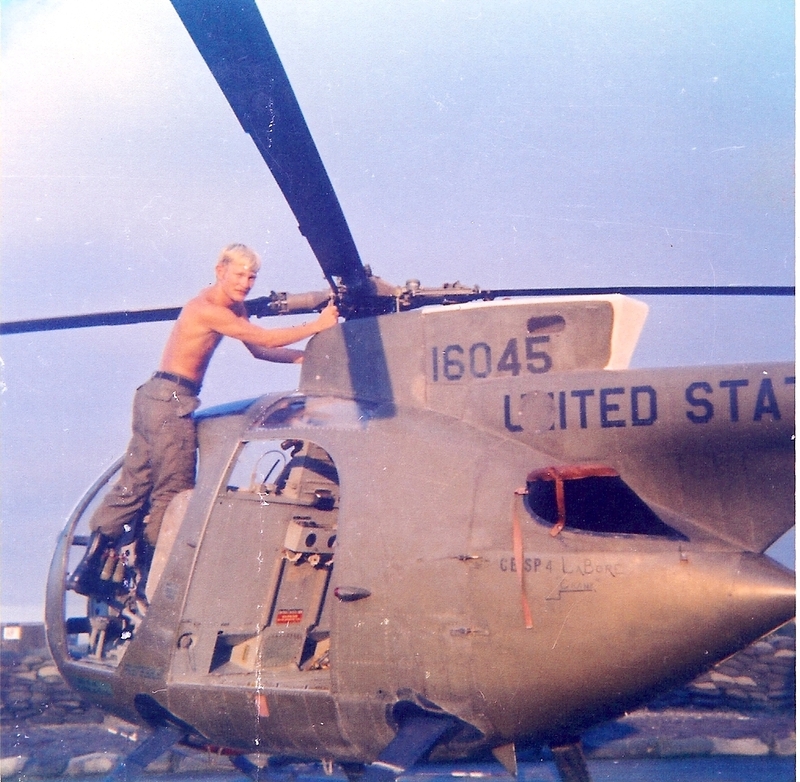 "Moose" prepping for his next scout mission.